Alabama’s storied football history began in 1892 when law student William G. Little learned how to play the game at a prep school in Massachusetts. He brought on back to the school and taught it to everyone else. One of the nicknames back then for the team was ‘Crimson White.’ Birmingham Age-Herald reporter Hugh Roberts helped coin the current nickname back in 1907 due to the red mud on the field for the Iron Bowl. It wasn’t until 1930 when another reporter, Everett Strupper, overheard someone in the stands saying, “Hold your horses, the elephants are coming,” when referring to the starting string coming back onto the filed. The elephant moniker stuck around as a secondary nickname and it took Melford Espey, Jr. to wear a costume representing the massive animal. He donned the heavy outfit in the early 1960’s. It was that same Espey who later became an official and, with the influence of legendary coach Paul “Bear” Bryant, commissioned a new version of the elephant costume. The costume made its first appearance during the 1979 Sugar Bowl, when they beat Penn State for the national championship. 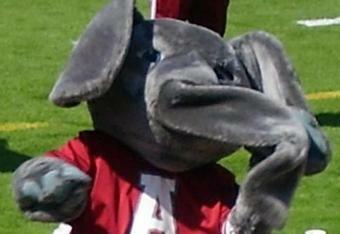 That very game cemented Big Al’s presence as official mascot for the Alabama Crimson Tide. Now that the head scratching over Big Al’s origination from a school with a color as a nickname, let’s check out this fuzzy pachyderm. Big Al is a big elephant. The hooves (or feet we’re not sure) start out the costume and end up gray up top. In pure Disney style, Big Al wears no pants but sports an Alabama jersey with an ‘A’ on the front. His head is huge and the trunk runs long. After feeling the summer heat over the weekend, we can sympathize with the person who has to wear this out in the southern heat. At least there are strategically placed air holes on the head portion. For a mascot, Big Al is okay in our book. 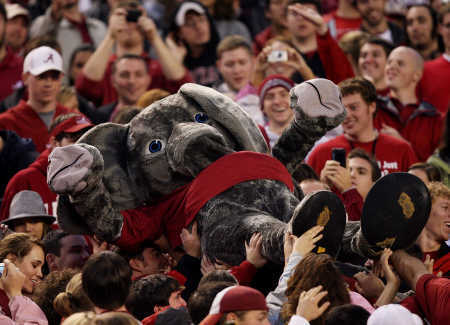 We’re not too terribly excited about Big Al as a mascot, but he fits the bill and falls in line with the other thundering elephant on the Crimson Tide’s offensive side of the ball in Mark Ingram. Will the Crimson Tide repeat as the BCS National Champion this year, riding on the back of Ingram? Phil Steele seems to think they will just miss the mark. We think so too, but only because the SEC is so tough. With Mark Ingram and Big Al rumbling through the schedule, however, you know that they will be in it until the very end.